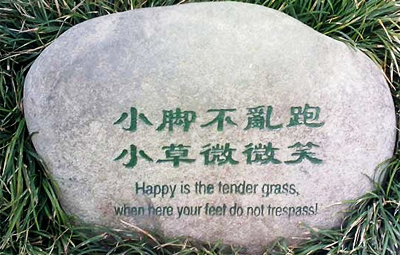 Need A Laugh – Try Chinese Happy Grass! China is not really a very nice place and it’s very polluted so I urge you don’t plan to stay long, but a short stay in any of the main cities that serve the West with the hard labour of their sweatshop style factories producing Computers, TV, cell phones and all of the rest of the crap that we think we can’t do without or any of the other cities that have dedicated themselves to parting Westerner’s hard currency. These cities are of course called known in China “tourist destinations for foreigners” show you what I mean. China may be a dreadful place where the words ‘Cat’ and ‘Dog’ are menu items but you have to hand it to the hairy little sods their signage is second to know when you need to smile. As the picture below proves the Chinese are really very odd and have a view on life that is alien to us Westerners what is happy grass! I ask you! Ladies and Gentlemen I give you, along with that other ‘developed’ country India, the world leaders of the future! There I knew you wouldn’t be sad for long and you haven’t even boarded your plane to China yet! Following on from my earlier blog today when I said that the craftsmanship of the Chinese leaves a lot to question here is yet another example of the dangers of using anything with the ‘Made in China’ label on it, and a number of people commented that I was being a little hard on the Chinese. Well here is my answer they can’t even make a bridge properly and if they can’t do something as basic as that do you trust them to make something that has large amounts of very dangerous electricity running through it in front of you if you use Chinese made computers, TV’s and all the rest of the tat that they churn out without regard to something called good old fashion quality of manufacture. 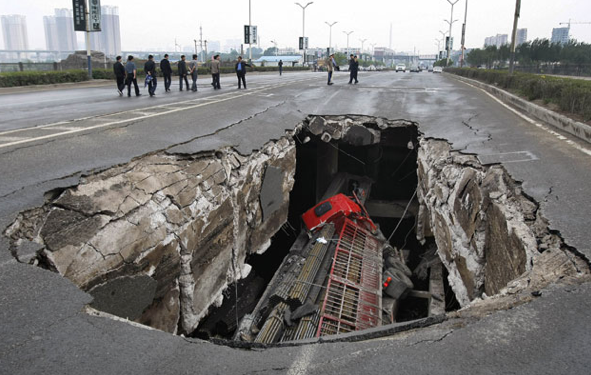 Part of the structure of a bridge collapsed into a river yesterday in Changchun, Jilin province, China two people were injured and also the Chinese national pride too at least if their national pride was a little dented they would recognise that they have to try harder when the manufacture things or build them. As a lot of us know Hollywood’s latest animated blockbuster from Dreamworks, the Chinese themed Kung Fu Panda II, opened in the US and China at the weekend and it by all accounts did rather well, which is nice. 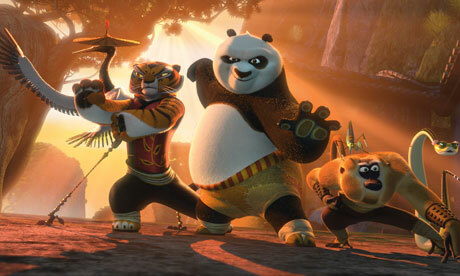 The first instalment (imaginatively entitled Kung Fu Panda II – but with one less ‘I’) broke box office records in China three years ago but was criticised in some quarters as western exploitation of Chinese culture. Do you agree with with this Cat and think that the Chinese have at least two faces and are being rather silly about saying that Kung Fu Panda I or indeed Kung Fu Panda II are “western exploitation of Chinese culture!” After all what would you call making all of the goods that the West use everyday like iPads, iPhones, Computers that even aren’t Apple ones, TV’s and of course so much more if it isn’t Chinese exploitation of Western culture. To say nothing of the fact that almost everything made in China is badly made, falls apart as soon as the product is removed from the safety of its protective packaging, and of course that most of the counterfeit DVD’s and other pirate products are made in China and sold in the West. All of which I am sure means that the Chinese have a sauce pointing a finger at the West for exploitation and should be the last to lecture the West about exploitation especially when they now have jobs that used to be Western jobs and the families who relied on them are flat broke. Surely the Chinese take the biscuit for exploitation – right out of hungry Western mouths in fact. Changing the subject for a moment I would just like to thank a record number of people for buying my latest book and masterpiece of feline literature ‘Getting out – Excerpts from a Cat’s Diary’ during June, it is obviously perfect reading for the Summer and I hope that you enjoy it while you are tanning on a beach somewhere very warm. One thing I would say on the subject of buying books – well I promised my translator I would – is that copies of his ebooks are available on Amazon.com and all other great retailers so when you go to Amazon.com to buy my book or to my www – wickedly wonderful website here www.thecatsdiary.com do have a look at John Woodcock’s books ‘Trams of Prague’ and ‘AstroMouse,’ they are really rather good (he made me put that bit in but after reading them I agree). The other thing I would say is that avid readers of my books are in for a real treat very soon my next book ‘The Travelogue – A Cat Against The World’ is soon to be available in the same great bookshops and websites as ‘Getting Out’ isn’t that wonderful?